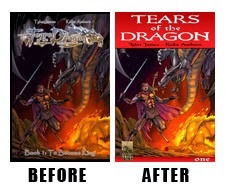 Here's an article by Tyler James, author of Tears of the Dragon, in which he talks about some ideas behind designing your cover/promotional image for comiXology. Good ideas, well worth a read. But let's think about why he's writing it for a minute. I don't mean why is James writing an article about submitting to comiXology, but rather why is James writing an article about submitting to comiXology? The answer is almost so self-evident that I think the question gets overlooked. In submitting a comic to comiXology, a creator is trying to tap into the largest distributor of digital comics. I mean, why wouldn't you submit your work to them? Getting work in there gives a creator (well, most creators) a much broader set of eyeballs. A lot more people could potentially see (and pay for!) their work. So writing an article about making your work stand out in that environment is obvious, right? Back up a second, though. We're talking about comiXology specifically here. Not "a digital comics reader", not "a smartphone app". We're talking about one very specific company. Oh, there's other digital comic distributors out there, but is a creator going to get any traction with them? They're either specific to one company, or they're so obscure that it's essentially not worth your time. If you want your comic to be seen in the digital comic space, you have to go through comiXology. Kind of like how if you want your comic to be seen in the physical retail space, you have to go through Diamond. Let that sit for a bit. What Diamond is to print comics, comiXology is to digital comics. One has a monopoly on printed comics, one has a monopoly on digital ones. How/why do you think Marvel and DC wound up delivering their digital comics on the same day as their printed ones? You remember that whole "day and date" debate from a few years back? Where did that go? It's a non-issue now because the one distributor of digital comics convinced the two biggest publishers it didn't make sense to have multiple release dates. Sure, technically, it was Marvel's and DC's independent decisions to go ahead with that, but you think comiXology didn't provide more than a little influence there? Look, I'm not mad at comiXology or am trying to launch some kind of campaign against them. They've got a good product, and done some great work in front of and behind the scenes. Many kudos to them. But it's worth pointing out their similar position to Diamond as it relates to digital comics, and that the twelve years it took for Diamond to become a print comics distribution monopoly, comiXology achieved digitally in... what? Five years? (They launched in 2007 and got big deals with Marvel and DC in 2012.) Not to mention that Diamond came to the direct market game after the model had been around and somewhat established for a decade, compared to comiXology all but inventing their model. In comics circles, we've talked a lot about the success of digital comics over the past few years and that has been almost exclusively due to comiXology's efforts. And it's fantastic that more people are getting more into comics. But that its long-term direction is effectively in the hands of a single company does give me a moment's pause.